The 23rd Annual Government Video Expo will bring together more than 4,000 professionals from the government, military, law enforcement, education, non-profit, and broadcast sectors. GV Expo focuses on the video production and AV industry for the public sector and is the largest event of its kind on the US East Coast. Visitors of booth 400 will be able to discuss the latest trends in the KVM industry with the KVM experts from G&D North America, who will also show them the most recent highlights of G&D’s product range. KVM systems enable the spatial separation between humans and computers and thus also make it possible to remove computer equipment from production desks or control stations, i.e. generally from the immediate broadcast area. KVM matrix systems extend computer signals via CAT or fiber optic cables and enable distributed switching and thus the simultaneous operation of several computers via one producer console. The video servers can be placed in a secure and air-conditioned equipment room and are operated in real time from a studio, the direction or the postproduction. The brand new matrix system for KVM-over-IP will be the highlight of G&D’s booth at GV Expo. The ControlCenter-IP stands out through its high flexibility and versatile functions. 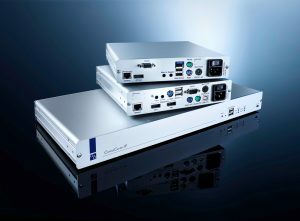 Used together with IP extenders, the central module forms a powerful matrix — the connected computers can be switched as an n:m connection and operated remotely in real time. While the network infrastructure takes over the transport of KVM-over-IP by using network switches and routers, the ControlCenter-IP contributes the logic. Through the network connection and the use of standard network components, the application becomes highly flexible and cost-effective. On top of this, the systems can be easily expanded and scaled. G&D IP devices are compatible with each other and let customers optimize and expand their systems at any time. The ControlCenter-IP switches numerous signals such as DP1.2a and DP1.1a, single and dual link DVI, audio bidirectional, USB and PS/2 keyboard/mouse, and RS232 transparent. Combined with G&D’s high-performance IP extender systems, even 4K Ultra HD signals can be processed at 60 Hz via the ControlCenter-IP – pixel-perfect, latency-free, and fail-safe.